(Glenn’s Tech Insights… used to be part of our bi-weekly newsletter but we decided to make it a regular blog post instead so it can get more visibility. It covers interesting new hardware and software developments that are generally relevant for SQL Server). On January 17, 2019, the PCI-SIG ratified version 0.9 of the PCIe 5.0 standard, with version 1.0 of the standard expected to be ratified later in Q1 of 2019. PCIe 5.0 doubles the bandwidth of PCIe 4.0, going from 64GB/s with sixteen lanes to 128GB/s with sixteen lanes. The PCIe 4.0 standard also doubled the bandwidth of PCIe 3.0, which was “only” 32GB/s with sixteen lanes. Currently, no released AMD or Intel processors have PCIe 4.0 support, but the upcoming 7nm AMD Ryzen 3000 desktop processors and the AMD EPYC “Rome” server processors will both have PCIe 4.0 support. 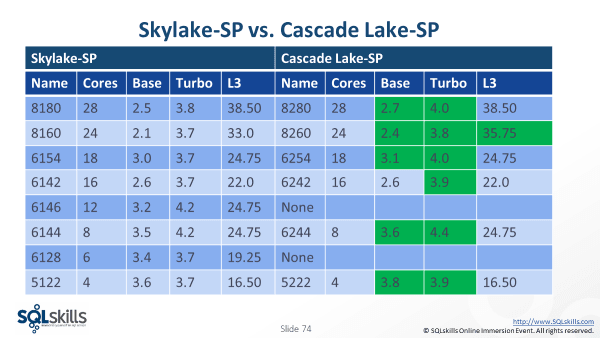 The upcoming Intel Cascade Lake-SP server processors will NOT have PCIe 4.0 support. After you have processor support for PCIe 4.0 and greater, you will need storage devices that support PCIe 4.0 and greater. The first public PCIe 4.0 NVMe SSD was demoed by Phison at CES. It was a Phison PS5016-E16. This SSD did 4069MB/sec for sequential reads and 4268MB/sec for sequential writes on CrystalDiskMark. Phison claims that the released version will have speeds up to 4.8/4.4 GB/s of read/write sequential throughput. This card is due to go on sale in Q3 of 2019. ServeTheHome has a thoughtful article looking at the market share gains in the server space by the current generation AMD EPYC “Naples” processor. This processor was first released in mid-2017. AMD has gone from 0.8% in Q4 of 2017 to 3.2% in Q4 of 2018. That is still a small number, but I believe that market share will start to increase at a much faster rate during 2019 and 2020. This is because both HPE and Dell EMC have multiple AMD EPYC systems on the market. Another reason is because the 7nm AMD EPYC “Rome” processors are due to be released in mid-2019. I think the AMD EPYC “Rome” processor is going to be a huge success. Rome will have PCIe 4.0 support, very high memory density, and possibly better single-threaded performance than Intel Cascade Lake-SP. 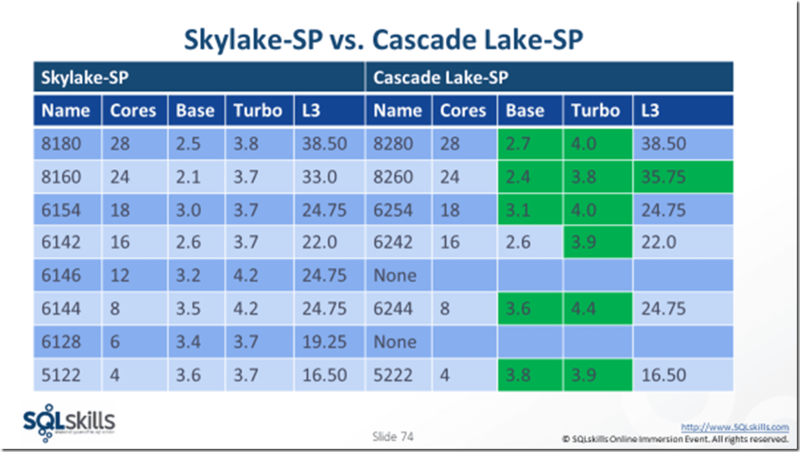 This could make the AMD EPYC “Rome” processor a better choice for SQL Server OLTP usage than Intel Cascade Lake-SP. We will see as we get closer to release, and start to see more benchmark results. RedGamingTech reports that the upcoming 7nm AMD Ryzen 3000 “Matisse” mainstream desktop processors (and a new, optional X570 chipset) are going to be released by AMD on July 7, 2019. This will happen during Computex 2019. The expectation is that these AMD processors will initially have twelve physical cores. There will be a 16-core SKU being released later in the year. This SKU will counter the expected release of the 10nm 10-core Intel Comet Lake desktop processors. It is possible that AMD will then have both a single-threaded CPU performance and a core count advantage. These processors will also sell at a lower price than the competing Intel mainstream desktop parts. This situation will probably true for at least nine-twelve months. This is not good news for Intel, and it will be interesting to see how they respond to this challenge. Data Platform MVP Ola Hallengren has created and maintained his free SQL Server Maintenance Solution script for over eleven years now. His script creates some objects in your master system database (by default). It also creates and enables twelve SQL Server Agent jobs. These jobs do things like database backups, index maintenance, and database integrity checks. It is a great solution that many SQLskills.com clients use. In order to have the jobs run, you will need to create SQL Server Agent job schedules for each one. An enabled SQL Server Agent job that does not have a schedule associated with it will never automatically run. I frequently help clients setup and configure the Ola Hallengren SQL Server Maintenance Solution. After many years, I finally got tired of manually creating a job schedule for each of the SQL Server Agent jobs. I decided to create a T-SQL script that you can run to create a schedule for each of the twelve jobs, which you can get here. You can (and probably should) modify the schedules in my script to suit your business requirements and infrastructure. For example, depending on your Recovery Point Objective (RPO) SLA, you would probably want to change how often you run transaction log backups. Another example is deciding when to run resource intensive jobs. These would the “DatabaseIntegrityCheck – USER_DATABASES” job or the “IndexOptimize – USER_DATABASES” job. If you have you have shared storage, you would want to be more careful about your job scheduling. In that case, you will want to ensure that every instance is not doing resource intensive jobs at the same time. Please let me know what you think of this script and if you have any suggestions for improvements. Thanks!